nineThe Irish weather has had some bad press. In fact, one joke quips that the usual way to tell the difference between winter and summer in Ireland is to measure the temperature of the rain. 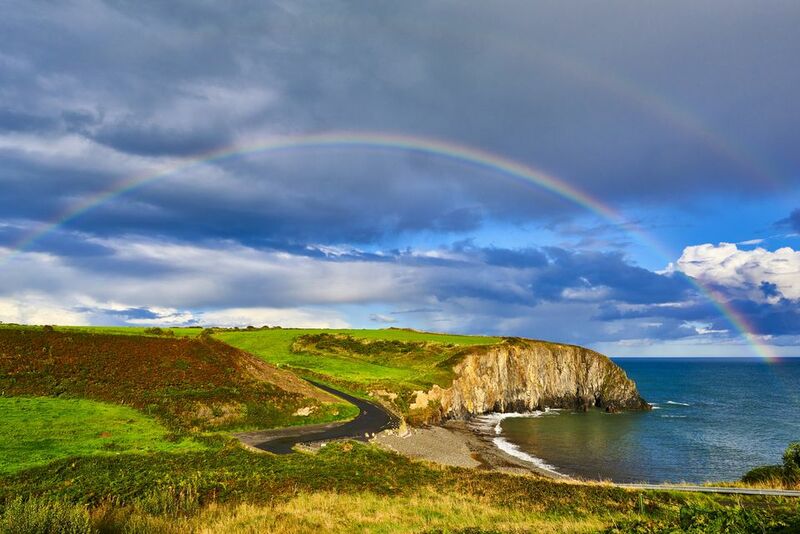 While it is true that there are no really major temperature differences between the seasons, and that rain is likely every second day, the Irish weather is manageable. That is if you are prepared for everything it can throw at you, often on the same day. Temperatures will rarely go below 32 degrees Fahrenheit (zero degrees Celsius) and only occasionally above 68 degrees Fahrenheit (20 degrees Celsius), with June, July, and August being the warmest months, and January and February the coldest. Extremes are not unknown though; the summer of 2006 was one for the ages, with temperatures jumping above 70 degrees Fahrenheit (21 degrees Celsius) nine times. On the other hand, rare freezing spells tend to bring the country to a grinding halt and even a sprinkling of snow will have most drivers panicking. The best times to travel to Ireland vary based on opinion. At this point, it should be enough to say that March through to June, and the September and October, ranks pretty high, though even a January trip to Ireland can be nice, albeit with short and often bitterly cold days. Located in County Donegal, this is the most northernmost point of Ireland and has some wild weather if the winds are high. Temperatures are fairly consistent throughout the year, ranging from an average high of 62 degrees Fahrenheit (17 degrees Celsius) in August, to a low of 37 degrees Fahrenheit (3 degrees Celsius) in January. January is the wettest month, with rainfall on nine days, and also one of the darkest months, with just 72 minutes of sunshine per day on average. Belmullet, in County Mayo, is a good example of weather along the Wild Atlantic Way. Summers here are reasonably dry, with temperatures averaging 63 degrees Fahrenheit (17 degrees Celsius) in August. Temperatures during winter rarely drop below freezing. November through January are the wettest months, receiving rainfall greater than 5 millimeters on nine days. Visiting the southwest of Ireland, counties Cork and Kerry? You may expect some of Ireland's warmest summer temperatures in the coastal areas of the Ring of Kerry. Winter temperatures are mild as well, with an average low of 39 degrees Fahrenheit (4 degrees Celsius). This region of Ireland is wetter than many other parts of the country and experiences an extended rainy season that spans October through January. Dublin is cool and damp throughout the year but is not the rainiest part of Ireland. August is the city's warmest month, averaging 65 degrees Fahrenheit (19 degrees Celsius), but there are minimal temperature fluctuations throughout the year due to the influence of the ocean. Temperatures in Ireland are cool from March through May and the weather is unpredictable. While you might wake up to a bright, sunny day, clouds and rain showers often roll through by the afternoon. Of course, true to its nickname, the Emerald Isle is a bright, lush green during the spring months and the sight of lambs frolicking in the field is not uncommon. Spring is actually often drier than the winter months and can be a great time to save money on tours and accommodations. What to pack: Given the unpredictable weather, it pays to be prepared. Pack light, breathable clothes for layering alongside waterproof outerwear. Take sensible footwear for the rugged terrain and plenty of cozy socks to keep your feet warm and dry. Summer is the most popular time of the year to visit Ireland. The country's lush landscapes are at their best, and despite what most lore would have you believe, the country experiences plenty of sunny days that are perfect for spending outside. Despite the warmer days, the sea temperatures rarely rise above 65 degrees Fahrenheit (18 degrees Celsius), so don't expect to go swimming. What to pack: The secret of coping with the Irish weather lies in taking the correct clothing with you. You should prepare for moderate weather at all time, and be able to supplement basic dress with a warm sweater or rainproof top, even in summer. Be careful on sunny days, especially on the beaches. Even though the breeze will cool you, the sun still burns your skin. Autumn in Ireland is cloudy and wet, with minimal sunshine. Winds can be quite strong during this season as well, especially during the later months. Late fall is the among the wettest times of the year, especially in Valentia, which receives an average of 7 inches of rain in October. What to pack: Pack appropriate rain gear and plenty of warm clothes for layering. An umbrella is obviously a must, but you might find it more convenient to carry along a jacket with a hood. Winter in Ireland is chilly but rarely freezing. Skies are generally overcast and rain is frequent, with occasional spells of higher temperatures that almost can reach 60 degrees Fahrenheit (16 degrees Celsius). Snow is rare throughout the country and may fall a few days per year, but doesn't typically stick. Even on clear, cold nights, there will only be a light frost. What to pack: Despite the mild temperatures, the moist air can make temperatures feel much colder than they actually are. Bring warm clothes, including heavily knit sweaters, a heavy jacket, and winter accessories. Waterproof and insulated shoes are strongly recommended as well.